The Land Act of 1796 sought to encourage settlement in the Northwest Territory by allowing for purchase of lands in that region. The minimum purchase allowed by the Act was 640 acres, and the minimum price per acre was set at $2. Only a small amount of land was sold under this act before Congress lowered the minimum acreage to 320 in 1800 and permitted the buyer, after a cash payment of one-half the value, to pay one-fourth the value in two years and the final fourth in four years. A law of 1804 further lowered the minimum purchase to 160 acres. The actual prices paid by many settlers were undoubtedly less than this list price, because military veterans were often paid in land warrants to help them buy land at a discount. The warrants for Revolutionary War service were issued under acts passed in 1788, 1803, and 1806. The 1788 act gave free land in the public domain to officers and soldiers who served during the Revolutionary War. The law provided a scale, so that a private or noncommissioned officer would be entitled to 100 acres of bounty land, while a brigadier general received 850 acres. A 4,000 square mile tract was located in the Northwest Territory and was set aside for these land warrants. This area came to be known as the U.S. Military District of Ohio. 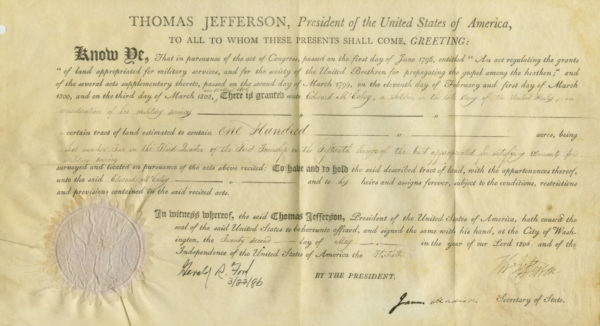 Originally the lands in this district were to be distributed by January 1, 1800, however additional time was needed to grant warrants to soldiers with late applications or uncompleted claims. Congress passed the act of 1803, which was later amended by the act of 1806, to extend the time limit. Edward McCauley was a private in the Revolution who served in the 8th Pennsylvania Regiment of the Continental Army. The regiment was engaged at the Battles of Brandywine, Paoli, and Germantown in 1777, and a portion of the regiment then fought at Saratoga. It was assigned to the Western Department in May 1778. McCauley was entitled to land under the warrants for Revolutionary War service. 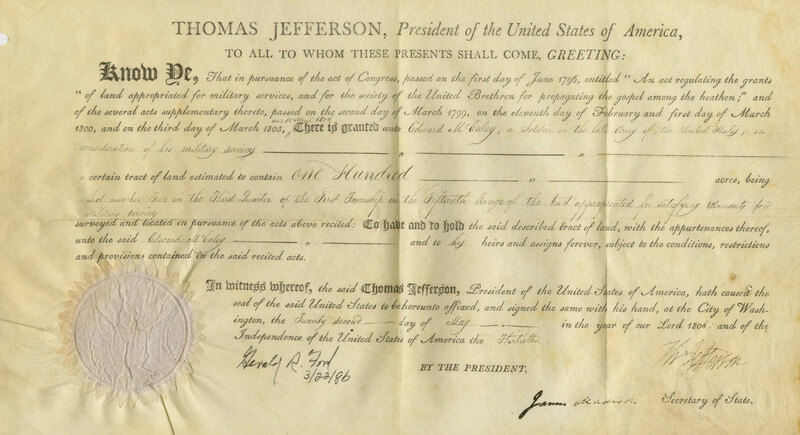 Document signed by Thomas Jefferson as President and James Madison as Secretary of State, Washington, May 22, 1806, granting McCauley (mis-spelled McCaley) 100 acres for his service as a “soldier in the late Army of the United States”. 180 years later the owner of this document asked former President Gerald R. Ford to sign it, which he did, dating it 3/22/1986. Thus there are three presidential signatures present on this document.